We have a limited selection of ballasts, but this is because the types of ballasts we use are designed to be used in a variety of applications, plus they have all been extensively tested specifically for UV output. 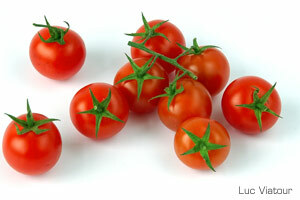 UV lamps are different, and the ballast you use can affect how much UV you get from the lamp. Regular office lights are pretty much all the same, designed to run around 32 watts each. There is never an application where you would run them at anything lower or higher. Our lamps are different from regular office lights, and even from other UV lights, in that they are engineered from the ground up to run on a variety of wattages, with advantages and disadvantages at each level. This lets you power the lamps at the "sweet spot" for your application, getting longer lamp life and/or much higher output. How different are the lamps? The lamp ends, the glass, the phosphors, literally every single component is different than regular lights or generic UV lights. We just put it in a form format that is common and familiar to make fitting existing fixtures easier. You might find our Power Chart handy. A bit technical, but it provides some rock-solid comparative numbers, based on testing in our labs using the same reference lamps. Almost all people using the four foot lamps (F32 or F40) for plant stressing, whether they are growing medicinal cannabis or just augmenting UV in a greenhouse full of tomatoes or peppers, they will just use off the shelf 32 watt light fixtures. You can use the Workhorse 8 and connect up to 6 lamps, but this is overkill. The lamps are so strong, you would only be running them for minutes a day. It is cheaper and easier to just use single bulb fixtures, which you can buy for $30 or so at Lowes, Home Depot, off Amazon, or from any hardware store. The lamp was designed to still put out a tremendous amount of UVB at just 32W. This also means that if a fixtures dies a few years down the line, you just swap it out with any generic 32w or 40w ballast, or just go buy another cheap fixture. There really is no reason to get tricky with the lights when you are using them for growing unless you are using in a greenhouse and want maximum output, so you can cover a larger area. Those of you that are curing items like fishing lures, pool cues or similar items that only need 4 lamps of the FR32 size, the Workhorse 7 (WH7) is the best bet. It pushes the lamp into HO mode, delivering about 45 usable watts per lamp, which jumps up the UVA output by around 50%. If your design will accommodate 6 lamps, you can get by with the Workhorse 8 (WH8) and use it to power all 6 lamps (The WH8 can power 4, 5 or 6 lamps). It will power them lower, at about 40 watts, but the total UV delivered will be a bit higher. If you need 8 lamps, two of the WH7 ballasts are better. For 12 lamps, either will be fine, although using three WH7 ballasts instead of two WH8 ballasts will result in 30% more available UV. Surfboards and other long items almost always use the SG-1 lamp. It is 6 foot long, you can put them end to end to get 12, 18, 24 feet of area, and build the rig out as wide as you want. The 6 foot FR71T12 lamps also tend to last a lot longer, twice as long in most applications. For the FR71 lamps, the SunHorse is the way to go. It is literally the only ballast designed for powering ONLY UV lamps, and delivers more UV per watt when properly matched with lamps. This really depends. 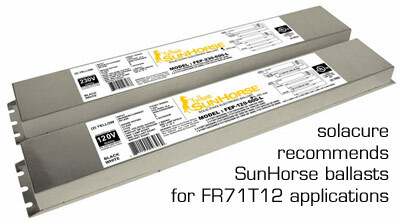 The FR71 lamps (6 foot) might be the best bet, using the SunHorse ballast, which powers four of them. In other cases, simply using more of the 4 foot lamps is better. The 6 foot lamps aren't quite as powerful in the 365nm range, but they have three times the total power, which more than makes up for it. Honestly, if you don't have a specific design in mind, it is best to call, because each situation is so different.